As a mortal, to enter your afterlife, you must first die. How you die is your choice but all must enter through the void of transcendence. Only the brave will follow the light, crawl out of the grave and go to hell and back. Logical thinking and teamwork is what you need to ensure that when your hour is up your name is found in the Book of life. Will you escape and be granted your life back, or will you be left to wander the afterlife for eternity? WILL YOU BEAT DEATH HIMSELF? YOU HAVE 60 MINUTES. The theme of Afterlife is what initially drew me to book this game – you need to complete a series of puzzles set out by Death himself in order to save your life. 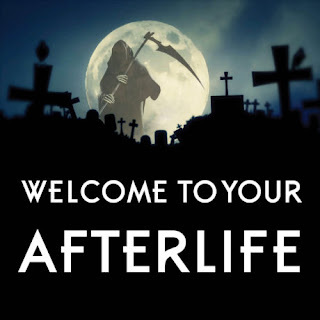 At the time of writing, Afterlife is the only game at X-it. 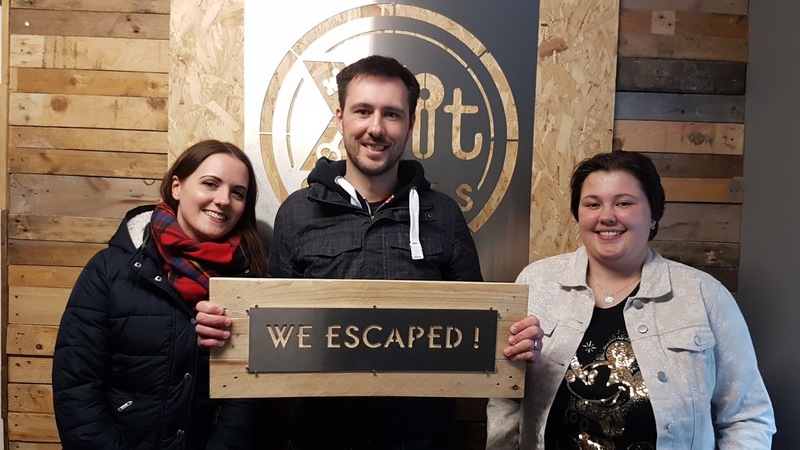 X-it is a very new feeling venue with a nice modern waiting area with lots of interesting escape room board games and toys to buy – probably the largest selection I’ve seen at any venue I’ve visited. We received our standard safety briefing and then we got a choice of a few cards to choose some power-up type things for our game – we chose pen & paper, a torch and 5 extra minutes (you never know!). The goal of the game is to find the book of life and sign your names to return from the Afterlife. After receiving some background on the game, we entered the transcendence room. The start to this game is brilliant. In darkness, a voice informs you of your journey ahead. You then solve a simple puzzle that cleverly uses light and sound to give you a very on theme and appropriate start to the game. Once that’s done, you enter the main game space by one of the most unusual ways we’ve seen in any game. A really really excellent start. And from there, the game only gets better and better. The bulk of it is spent in a well themed graveyard with a series of puzzles based around one large central puzzle. Each puzzle you complete allows you to work a step closer to completing the central puzzle. I love games like this that give you a really clear aim and you know what you’re working towards. There was quite a bit of searching and observation required in this initial space, with a few nice riddle, translation and jigsaw style puzzles that we enjoyed. They managed to cleverly weave the theme of death into lots of the puzzles in an amusing tongue-in-cheek style. One particular puzzle was really clever and unusual, themed around embalming… I’ll say no more. After the first space, we thought we’d be near the end of the game. Little did we know how much we still had left to do. In this game I counted a total of 8 different spaces, many of them initially hidden away out of view. This gave the game an amazing sense of discovery and exploration. You never quite knew where you’d end up next. In fact, the only clue we got in the entire game (delivered via a screen) was where one of the hidden spaces was. I don’t want to give anything away that spoils the sheer surprise and delight as you uncover new spaces – all I’ll say is that you have to journey through heaven and hell before you escape the room. In hell, it was a dark and rocky space with two large puzzles to solve. 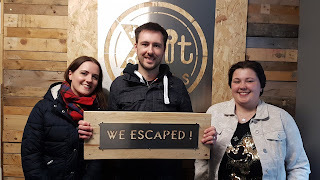 In heaven, it was a white and golden space with two physical puzzles to solve (one of those required very skilful teamwork!). The game ends with the discovery of the Book of Life where you get the immense satisfaction of signing your names and returning from the Afterlife. We absolutely loved this game and it instantly went down as one of our favourites. The theming and story of the game is brilliant, with so much to explore and lots of varied and fun puzzles to solve. We also love games that we “click” with. This was one of those where we found everything incredibly logical and only required a single clue to find something that we considered quite well hidden. With the standard of this game, we really can’t wait to play more games at X-it. The team were Becky, Daniel and Beth. Overall A truly spectacular game with a great storyline and non-stop adventure from the very first second. There are many different spaces to explore as you battle to save your life. We loved this game and really can’t fault it. Difficulty There’s lots to solve, but it’s all extremely logical and flows well. There’s quite a bit of searching as well – but unusually for us we did very well. Fun We had so much fun in this room. We absolutely love well themed games with lots of spaces to explore. This well and truly ticked both of the boxes. Puzzles There is a huge variety of different puzzles in this room with some really unique and clever ones that play to the theme of the room. There are padlock style, skill based, jigsaw style, maths, observational and many more puzzles to interact with. Immersion From the dark shadowy atmosphere of the transcendence room to the pure white walls of heaven and all the spaces in between, this game truly immerses you in a series of fantastically themed spaces. Surprises This game is packed full of surprises, atmosphere and wow factor throughout. It starts with a surprising and unusual entrance and continues throughout as you uncover more hidden spaces.